Canadian-Greek indie-pop artist Katerine Duska co-writes Greece’s entry, ‘Better Love’ with Greek-British musician Leon of Athens and Scottish songwriter David Sneddon. Greek broadcaster ERT confirmed earlier this year that Ms Duska would fly the Greek flag at the Tel Aviv Expo for the upcoming Eurovision Song Contest in Israel. Montreal-born singer-songwriter, Katerine, 29, has recorded the song in London with producer and friend Phil Cook. ‘Better Love’ features strong vocals and that trademark soulful rasp, with melodic hooks swirling beneath the orchestral drums. This is a very original choice in terms of a Greek Eurovision entry and it’s a song that is uplifting and anthemic. The well-constructed tune is a very strong competitor this year with a catchy chorus and hooks, which excitingly build-up as the three-minute song captivates. The songstress has a unique and distinctive voice and she doesn’t hold back in this year’s Eurovision line-up. Katerine provides a strong vocal hook on top of an anthemic chorus to ‘Better Love’ and the vocally-impressive singer excels in her performance. The mid-tempo track is current indie-pop and radio-friendly; one that has already entered the London Greek Radio, (LGR), playlist. The ‘Better Love’ which the song refers to is the eternal quest for a higher love, one which is deep, unconditional and unapologetic. The lyrics about love and empowerment most people and no doubt the listener can relate to it on some level. Her soaring high-notes combined with strong melodic hooks give the tune that feel of a “competitive” package and a possible game-changer, as Greece embarks on a comeback to the Eurovision final, after a shock exit at the semi-finals last year. The music video relies on strong pop-art visuals with pink, light-colours. The creative woman behind this video is Efi Gousi and she manages the staging in Tel Aviv. Katerine Douska wears pink reinforcing the theme of purist romanticism and a “better love”. The video is a females-only cast looking very disciplined and artistic. Katerine said that the staging is planned to compliment the “pop-art” atmospheric concept and she will be joined on stage by backing-vocalists Erasma Markides and Eleni Ponzantzidou along with dancers Dimitra Vlachou and Fania Grigoriou. Ms Duska was raised in a Greek home listening to esteemed composers Mikis Theodorakis, Manos Hatzidakis and Mimis Plessas, spending countless hours as a young teen tuned into soul, pop and R&B. She has a background in classical music where she studied classical guitar and interpreting Arias and Lieder, venturing into ‘experimental song-writing’ influenced greatly by the indie-pop and Neo-soul genre. Katerine studied law at the Kapodistrian University of Athens, only to realise that music was what she actually wanted to pursue professionally. Katerine rose to indie stardom in 2014 with the hit, ‘One in a Million’ and her cover of the Arctic Monkeys, “Do I Wanna Know”, which has reached over a million views on YouTube. Her 2015 debut album ‘Embodiment’ won critics over with the lead track “Fire Away”, featuring prominently in a Nescafe Canada advertising campaign. Greece competes in the Eurovision first Semi-Final which airs on Tuesday 14th May at 8pm GMT. She performs in the running order of 17 at slot number 16. The Eurovision Song Contest Final is broadcast on Saturday 18th May at 8pm GMT. For all of your Eurovision news on Greece, make sure you regularly check back to lgr.co.uk and tune into LGR to hear ‘Better Love’ this Eurovision season. London Greek Radio wish Katerine and the Greek delegation the very best of luck in the competition. Greek broadcaster ERT have confirmed that the Greek-Canadian singer/songwriter, born in Montreal and currently residing in Athens, will sing the song ‘Better Love‘. The self-penned tune is co-written with Leon of Athens and David Sneddon. Katerine describes her music as alternative producing indie pop, indie folk, and neo-soul. Greek ERT TV bosses set-up a working committee to choose the act for this year. The song was recorded in London with producer Phil Cook, who’s credited with working with, Little Mix, Ellie Goulding, Olly Murs, Callum Scott and Dua Lipa. The panellists felt that Katerine’s “unique”, impressive metallic vocal, coupled with the “modern” song choice were right for this year’s entry. The working committee comprised of chairman Dimitris Papadimitriou, Artistic Director of the Greek entrant in Tel Aviv, Adam Petros (Music Producer), Fotis Apergi (Journalist), Gianni Petridi (Music Producer), Maria Koufpoulou (Director of International Relations ERT) and Sofia Dranidou (Head of European & International Affairs – International Relations ERT). Katerine studied law at the Kapodistrian University of Athens only to realise that music was what she actually wanted to pursue professionally. Katerine studied classical guitar at the Music Academy, as well as singing under the guidance of eminent vocal coach Eleni Melissidi. A background in classical music with studying and interpreting Arias and Lieder by Verdi, Mozart and Schubert, to modern jazz, has a strong allegiance to music, whatever form it takes. Katerine rose to indie star status in 2014 with the hit, ‘One in a Million’ and her cover of the Arctic Monkeys’ “Do I Wanna Know”, reaching over one million views on YouTube. Her 2015 debut album ‘Embodiment’ won critics over with the lead track “Fire Away” featuring prominently in a Nescafe Canada advertising campaign. Her “trademark soulful rasp” has earnt comparisons to the late Amy Winehouse and it’s believed that she’s probably the first-ever Greek soulful artist, to hit the Eurovision stage. Greece competes in the Eurovision first semi-final which airs on Tuesday 14th May at 8 pm GMT. Hopefully, we will see Katerine’s progression to the grand final which is broadcast on Saturday 18th May. For all of your Eurovision news on Greece, make sure you regularly check back to lgr.co.uk and tune in LGR to hear ‘Better love‘ in the coming weeks. LGR Events Presents A Night with Rempetika and Laika, on Friday 15th March 2019, at the Cypriot Community Centre. The line-up is George Gregoriou aka LGR’s Kokis, Nikos Savvides, Giorgos Yerasimos, and Anna Sopiadou who is coming all the way from Greece will be entertaining us on the night. Join us at the Cypriot Community Centre, Earlham Grove, Wood Green, London, N22 5HJ. Admission £20, with souvlakia included. For more information and tickets please call London Greek Radio on 0208 349 6950! In 2019, our time has also been spent putting together events, such as this one, where all members of our community could come and celebrate our culture together. This event is sponsored by Aspris & Son, wine, beer and spirits merchants; Hellenic Bakery and Hellenic Gourmet; Sarrani, experts in property insurance repairs; Varosi Lettings and Estates, with guaranteed rental scheme. Christina Ellinas has wowed the judges with her performance to ‘Lullaby’ by Sigala ft Paloma Faith in her audition on The Voice UK. The third instalment of the series last weekend saw Tom Jones heap praise for the singer. Before auditioning, the 27-year-old former flight attendant told viewers she was “Greek Cypriot” and her beaming smile and bubbly personality clearly made a good impression on the studio audience. Christina was born in Liverpool and lives in London. She has performed in several pubs in Camden, singing acoustic covers of big names in the industry, such as Whitney Housten, Rita Ora, Coldplay and Zayn Malik. On last week’s show, she only required one judge to “turn around” in order to make it through to the next stage of the competition, but Will.i.am, Tom Jones and Olly Murs all turned around! Christina chose Will.i.am as her coach, who she once met on a flight she was working on. Will.i.am recollected “The year 2012 or 13…” when he met Christina at the airport lounge. That for sure is a pretty happy coincidence. Christina was supported by her grandmother in the ‘holding area’ with hostess Emma Willis. Grandma appeared delighted at seeing Christina’s progression to the next round. Christina mentioned on the show that she enjoyed cooking Cypriot dishes with her grandma. The singer plays the piano and has an Official Facebook and YouTube channel. London Greek Radio wishes Christina the best of luck in the talent show. Tamta Goduadze will represent Cyprus at this year’s Eurovision Song Contest in Tel Aviv in May. The Cypriot broadcaster CyBC announced the female artist and song a few weeks ago, ending weeks of speculation. Tamta will sing ‘Replay‘, a pop-dance, up-tempo number. Her entry is penned by Greek-Swedish hitmaker Alex Papaconstantiou, aka ‘Alex P‘, the man behind Eleni Fouriera’s ‘Fuego’ – the impressive runners-up from last year, along with Sweden-based songwriters Teddy Skye, Viktor Svensson, Kristoffer “Bonn” Fogelmark and Albin Nedler. Tamta, 38, was born and raised in Georgia, where she started singing at the age of five and moved to Greece at the age of 20. After singing on a TV reality talent contest, she was signed by a major record label in Greece and has a back catalog of several hits. The sure-fire Eurovision track is believed to be exactly moulded for Tamta’s signature pop-style credentials. CyBC chiefs felt that Tamta was right for this year’s contest as she is perceived earnestly to have the “complete package” that comprises of a strong ‘live’ singer and entertaining act. The Cypriot tune will be officially released in February or March, further maximising Eurovision fans excitement. Cyprus also returns with Eurovision artistic stage director Sacha Jean-Baptise, the woman behind ‘Fuego’. She will be tasked with elevating Tamta’s stage routine ensuring that it will translate into points on the scoreboard. The Head of the Cypriot delegation, Evi Papamichael explained that a big named artist would be a necessary solution to answer the Eurovision’s competitiveness, amidst so many countries, which numbers 42 this year. She said that Tamta was the broadcaster’s preference this year. Tamta has had a long-time quest to participate in the Eurovision Song Contest and almost came close to achieving it on previous occasions. In 2007 Tamta was pipped to the post by Cypriot singer Sarbel, in Greece’s Eurovision heat stages, with the ballad ‘With Love’. In 2016, she missed the deadline for the Greek selection process by a few hours with the subsequently-released track ‘Unloved’. Tamta felt it an incredible honour to be representing Cyprus, a nation which has always strongly supported her music endeavours and undertaking this bold task, was a way of her giving something back to her Cypriot fan-base. Having released four studio albums (including a Best Of) and multiple hit singles, Tamta is frequently heard on the LGR airwaves. For all of your Eurovision news on Cyprus, make sure you regularly check back to lgr.co.uk and tune in to hear “Replay” on LGR in the coming weeks. London Greek Radio wish Tamta and the Cypriot delegation the very best of luck in the competition. On Monday 31st December London Greek Radio are hosting our first NEW YEARS EVE at the Country Club Trent Park in Oakwood. 9 pm till 4 in the morning. Join us for the party of the festive season, featuring DJ Magis on the decks and live musical entertainment by Cypriot Greek singer Mixalis Theodosiou. Mixalis is expected to fire-up the atmosphere for what is said to be one of the biggest live Greek parties of the year. DJ Magis will be mixing Greek & English hits, all night long. Fusing all the best Modern Laika, Greek Club, Greek Classics and Zeimbekika with all the biggest English hits of the decade. Standard tickets are available for £25. For table packages please contact Vassoula at London Greek Radio on: 0208 349 6963. Event tickets are available to purchase below. See the website link… Or to avoid paying the online booking fee, tickets can also be purchased over the phone by calling LGR on 0208 349 6963. This event is strictly over-18s only. Party London Anna presents a live and exclusive evening with the well-known songwriter/composer Vasilis Saleas and his team of fellow-musicians. Vasilis will duet with Titi Mousika on clarinet; Sarantis Saleas, Efi Panou and Aggeliki Polizou. At Crystal Hall, Gate W5, 1 Poppin Business Centre, South Way, Wembley, HA9 0HB; and on 1st January 2019 at Piccadilly Banqueting Suite, 372 Stratford Road, Sparkhill, Birmingham, B11 4AB. To book your place and for further info 07999 955 770 or 07366 428 130. DJ Sooty with live performances by Elizabeth Chapman at The Decorium, 22 Western Road, Wood Green N22 6UH. 4 Course meal, fruit, tea/coffee & midnight vasilopita 8pm-2:30 am £80 adults/under 12’s £50 inclusive with food, or entry only £25 with seating 10pm-2:30 am. Ticket sales & info 020 3356 7777. The long-established Cypriot association are proud to announce, their massive party welcoming 2019 in Greek style! Good food and live music from Laiko-fused band, Prosfiges. Entry £35. Starts 7:30 pm. To book your tickets or for more info call 0740 440 3597 or 0794 041 9569. At the Greek Cypriot Women’s Organisation, Denmark Road, N8 0DZ, corner of Wightman Road. 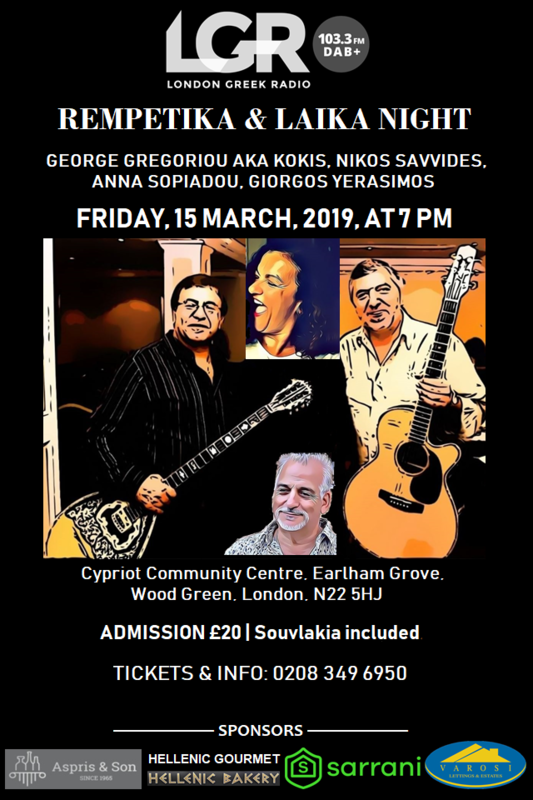 The much-loved and well-known duo, George Gregoriou and Nikos Savvides will be performing at The Cypriot Community Centre, Earlham Grove, Wood Green, N22 5HJ, for info 0208 881 2329. 1174 High Road, N20 0LH, for info 020 8446 6444. Chris Theoharous is the DJ on the night till late, with a dinner and dance set-up, organised by The Penridge Suite. 020 8362 0880. The band of Nikos Siakolas will be in live performance, barbeque, and meze courtesy of Sotiris Kampanelas, till the early hours. To reserve your place 020 8445 7070, or 07956 257 606. London Greek Radio (LGR) celebrates 29 years as a licensed radio station this month, just weeks after its 35th unofficial anniversary. On 8th October 1983, LGR began transmitting to the Greek and Cypriot community, as a pirate radio station and officially joined the FM airwaves on 13th November 1989. In the mid-1980s, tens of thousands of people signed a petition demonstrating the need for LGR to have a real presence within the community. The signatures were handed to the relevant authorities which subsequently contributed to the station being licensed by the radio authorities. The book, ‘London’s Pirate Pioneers’ by Stephen Hebditch tells the story of the capital’s pirate radio stations and the people who helped change the British broadcasting system. He writes about LGR’s undeniable legacy in the eighties and the intense pressures it faced to shut the station down. However, London Greek Radio became Britain’s first-ever licensed ethnic radio station upon being awarded its license. Over the years, London Greek Radio has become steadfast to a wide range of listeners; from maturing-settlers-to-the-UK to the coming-of-age of British Greeks and Cypriots – connecting listeners to their roots through a carefully balanced programming of music, speech, entertainment and news. Today, in addition to serving communities on 103.3FM, LGR has been taken into 21st-century broadcasting by joining the Digital Radio platform. LGR can now be heard in four major cities on DAB+ (digital radio), namely London, Birmingham, Manchester and Glasgow, crossing into Scotland. Furthermore, listeners extend worldwide at www.lgr.co.uk and the station has a free app for mobile devices which listeners can download from the App or Play stores embracing the ‘on-the-move’ audience. LGR’s newly appointed Managing Director, Tony Psillou, said, “More listeners are discovering the ever-growing London Greek Radio family every day, not only Greek-speaking listeners but English, Jewish, Albanian, Arab, Bulgarian, Turkish, Russian and many more that frequently tune in. LGR’s Chairman John Kyriakides, added, “With LGR’s edgier playlists of the biggest Greek and Cypriot tunes, Modern Laika, Greek Pop, Entehna, Golden-Oldies, Alternative, Folk and Current Chart Hits, we continue to serve the listener. On FM, Online, on your Mobile and On Digital Radio, This is LGR (London Greek Radio) ‘THE HEARTBEAT OF THE GREEK COMMUNITY‘. 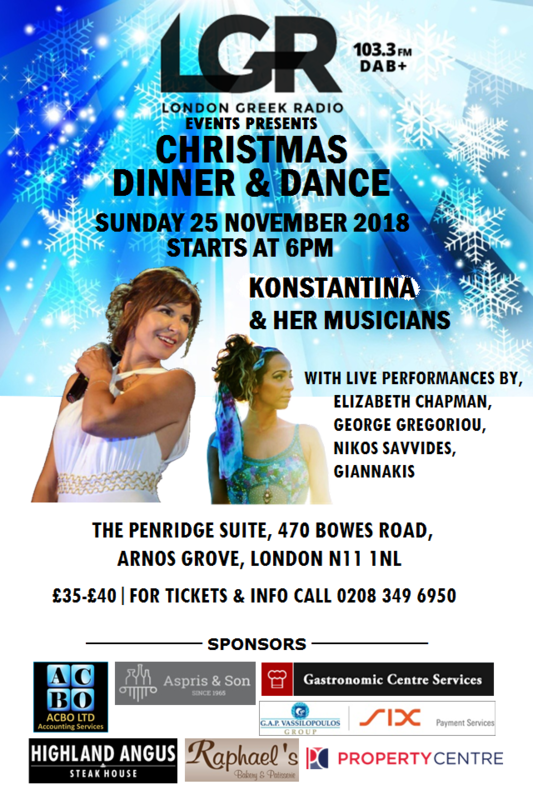 The Management and Staff of London Greek Radio would like to invite you to their pre-Christmas Dinner & Dance, 2018. The festive season kicks-off with live music and food on Sunday 25 November at 6 pm. We are also excited to announce entertainment for this evening includes the renowned Cypriot singer Konstantina, for a 1-night exclusive performance. Not to mention live music by Elizabeth Chapman, George Gregoriou on bouzouki, Nikos Savvides on guitar and Giannakis on the keyboard. Events like this offer the chance for our station to come together with the community and enjoy a fabulous evening. Moreover, through these events, we are able to renew and build a good relationship with both our listeners and the companies which work alongside us. In 2018, our time has also been spent putting together events, such as this one, where all members of our community could come and celebrate our culture together. Join us at The Penridge Suite, 470 Bowes Road, Arnos Grove, London N11 1NL. Doors open at 6pm, dinner will be served at 6:45pm. Tickets are £35 & £40. For more information and Tickets please call London Greek Radio on 0208 349 6950! 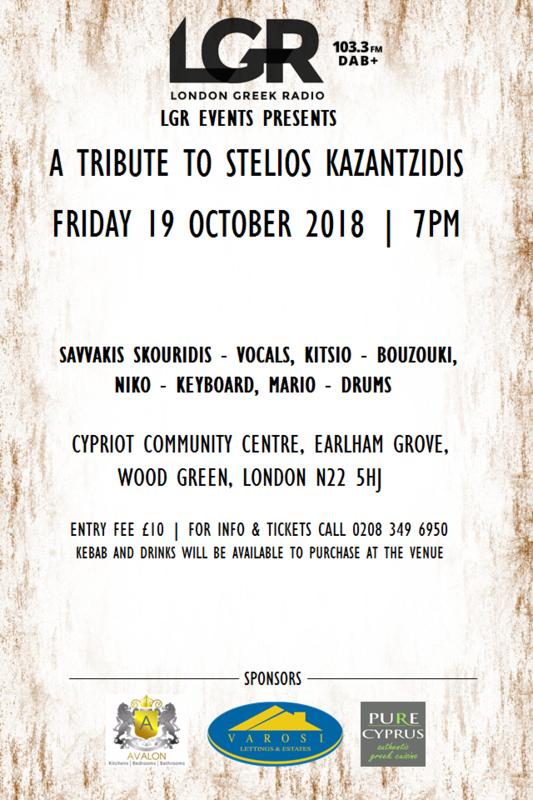 LGR Events Presents a tribute to legendary singer Stelios Kazantzidis for one night only, on Friday, 19th October from 7 pm, at the Cypriot Community Centre, Earlham Grove, Wood Green, London N22 5HJ. Entertaining on the night are Savvakis Skouridis (vocals), Kitsio (bouzouki), Niko (keyboard), Mario (drums). SOLD-OUT. Thank you for your tremendous support. Kebabs or souvlakia and drinks on sale at low prices. Music, dancing, in a pleasant and friendly atmosphere! The “British Cypriot” sitcom ‘Stath Lets Flats’ aired its first episode on Wednesday, 27th June on Channel 4. The six-part quirky comedy is written by Jamie Demetriou and Robert Popper, centred on a Greek-Cypriot estate agent. The subtle jokes, creative one-liners and a mild touch of slap-stick have earnt the series quite a following of fans. The unique-running gag is that Stath comes across as incompetent, impulsive and ambitious – in equal measure, and desperate to prove himself in the estate agent business to his Greek-Cypriot father. It’s a timely take on the “bewildering” minefield of the London property market; realistically dealt with, in LGR’s ‘Property Show’, with Karl Knipe of The Kings Group, but you won’t find Stath bickering with a smelly tenant there! The lovely Demetriou siblings Jamie and Natasia took time aside to visit LGR, with their Cypriot father Sotiris, from Koma Tou Gialou. They joined Vasilis Panayi live on-air and incidentally, London Greek Radio’s very own Vasilis excitingly-enough, shows up in the sixth episode of the TV series. Star-of-the-show, “Stath”, played by Jamie Demetriou, said, “London Greek Radio has been playing in my house since I was a foetus” commenting on the station’s long-time serving of Greek-Cypriot culture and music. Jamie’s real-life sister plays his fictional sister ‘Sophie’ and as the show progresses, it’s actually endearing to see their sibling relationship. “Stath (Eftstathios), is a useless Greek-Cypriot letting agent. There’s a lot of Greek letting agencies and we wanted to base it in Green Lanes, but it’s set in Edgware, which also has a Greek community. It’s about their office ‘Michael & Eagle Estate Agency”, Jamie told LGR’s listeners. Stath speaks with ‘London-Cypriot accent’, which complements his character and is an accent he once had as a young Cypriot. “We are on London Greek Radio and I think that’s so relevant because so many have made a life here, and they’re Londoners so the character of Stath encapsulates it. He talks in a London accent with a bit of a ‘Greek twang’ to it, which a lot of people have, and I hope a lot of people can relate to that.” Jamie emphasised. The Greek actor Christos Stergioglou plays Stath’s father Vaso; a witty, passionate patriarch who sprinkles a few Greek phrases in the script. Natasia who plays Sophie explained to listeners that the series was the result of years of hard work and serious determination, creating, and writing it. This programme hinges on its strong quirky-trait characters narrative; primarily being something of a platform for portraying, or perceiving the Greek-Cypriot community in London. ‘Stath Lets Flats’ continues on Wednesday 1st August at 10 pm on Channel 4. The next ‘Property Show’ with Karl Knipe airs on Wednesday 5th September at 7.00pm on LGR.